11/04/16 -- Soycomplex: Beans closed lower despite weekly export sales being fairly good at 455,900 MT for 2015/16 - up 8 percent from the previous week and 10 percent from the prior 4-week average. New crop sales 10,600 MT were reported for South Korea (9,800 MT) and Japan (800 MT). Exports of 408,600 MT were up 27 percent from the previous week, but down 21 percent from the prior 4-week average. Total YTD commitments on beans now total 44.909 MMT, or 97% of the new USDA target for the marketing year. May 16 Soybeans settled at $9.48, down 7 3/4 cents; May 16 Soybean Meal settled at $290.10, down $2.60; May 16 Soybean Oil settled at 33.69, down 27 points. Corn: The corn market closed with marginal gains. Weekly export sales of 1,135,800 MT for 2015/16 were up 20 percent from the previous week and 21 percent from the prior 4-week average. For 2016/17, net sales of 111,400 MT were reported for Japan (55,600 MT), Mexico (50,500 MT), El Salvador (4,500 MT), and Nicaragua (800 MT). Exports of 1,008,400 MT were down 11 percent from the previous week and 3 percent from the prior 4-week average. The Rosario Grain Exchange increased its Argentine corn production estimate today, but to only to 25 MMT versus the USDA's 28.0 MMT prediction. FranceAgriMer lowered French corn carryout this season by 200,000 MT. May 16 Corn settled at $3.74, up 1/2 cent; Jul 16 Corn settled at $3.78, up 1 cent. 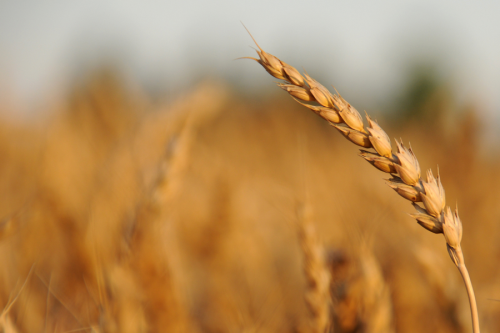 Wheat: The wheat market closed with small losses. Weekly sales exports for the soon to end 2015/16 season came in at 124,700 MMT, along with new crop sales of 211,500 MT. Exports were 309,200 MT were down 21 percent from the previous week and 18 percent from the prior 4-week average. If the US isn't doing a great job of disposing of it's own burdensome wheat stocks, some are doing better. Strategie Grains cut their EU-28 2015/16 soft wheat ending stocks estimate by 1.0 MMT to 15.6 MMT. For 2016/16 they were down 1.2 MMT to 13.2 MMT. South Korea has bought 45 500 MT of Australian wheat while Japan purchased 127 620 MT of wheat from the USA, Canada, and Australia in a routine tender. Jul 16 CBOT Wheat settled at $4.66 3/4, down 3/4 cent; Jul 16 KCBT Wheat settled at $4.65 3/4, up 3/4 cent; Jul 16 MGEX Wheat settled at $5.27 1/2, up 3/4 cent. 14/04/16 -- EU grains traded mixed, with wheat unfortunately the weakest leg of the gang. 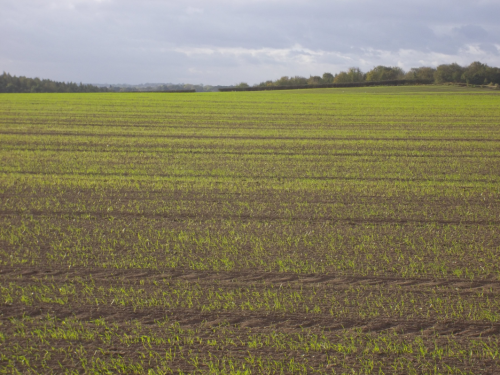 At the finish, front month May 16 London wheat was down GBP2.20/tonne at GBP103.10/tonne, May Paris wheat was EUR0.50/tonne lower at EUR156.25/tonne, June corn jumped EUR0.50/tonne to EUR156.25/tonne and rapeseed closed EUR2.00/tonne higher at EUR371.75/tonne. FrnaceAgriMer made a few downwards adjustments to their French 2015/16 grain ending stocks estimates. Essentially these were small downwards revisions to carryout due to better than anticipated exports to North African destinations like Morocco and Algeria that have shown up in recent tenders. French wheat stocks were cut by 0.6 MMT, and those for barley reduced 0.5 TMT, at the end of the current season. "Looking ahead, Moroccan millers and the countries wheat trade federation have requested that this season’s import window is extended to the end of May (rather than April), and that next season’s window opens in August (typically October). 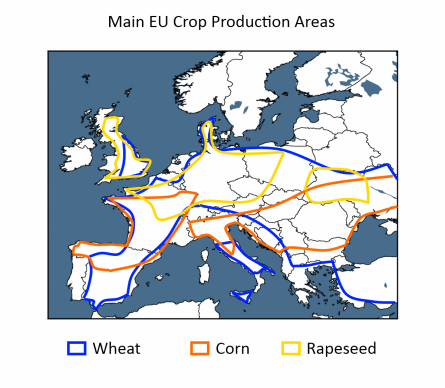 This suggests further export opportunities for France, but also potentially UK supplies of wheat," noted the HGCA. Maize end stocks (French corn carryout) were also reduced slightly (by 200 TMT), as a result of higher demand from the domestic starch industry, they added. It is still worth remembering that these inventory volumes are still historically high, especially with another anticipated bumper crop not far away now. French analysts Strategie Grains joined the chorus, reducing EU-28 soft wheat ending stocks by 1 MMT to 15.6 MMT. 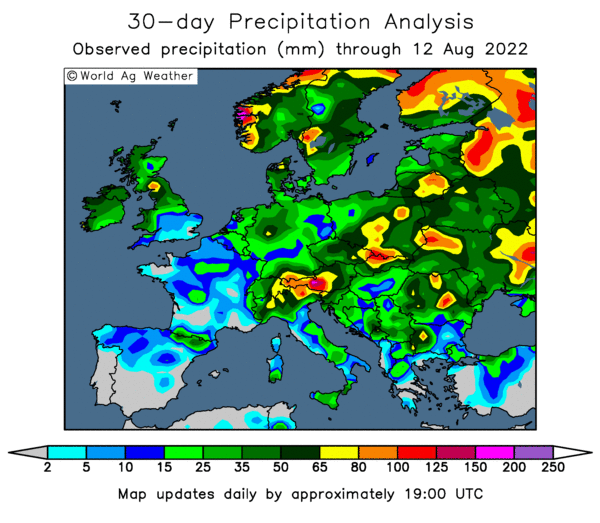 Looking ahead winter grains in Europe are "in very good condition… with very promising yield outlooks in France, the UK, Germany, central Europe and south east Europe," Strategie Grains said. 13/04/16 -- EU grains closed firmer across the board for once, following the release if Tuesday's WASDE report. 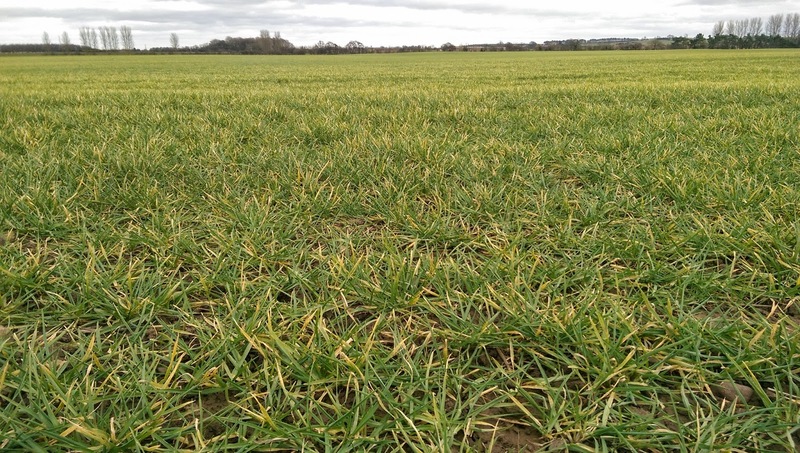 At the finish, front month May 16 London wheat was up GBP0.95/tonne at GBP105.30/tonne, May 16 Paris wheat was EUR2.25/tonne higher at EUR155.25/tonne, June corn jumped EUR2.50/tonne to EUR155.75/tonne and rapeseed closed EUR2.75/tonne higher at EUR369.75/tonne. Today's trade maybe got a lift from the notion that EU wheat carryout this year is now seen down from the 20.16 MMT predicted a month ago to 19.33 MMT this time round, although that's still a 40% increase compared to last season. That came courtesy of increased domestic usage, and despite a 500,000 MT hike in the size of last year's crop (now seen at 160 MMT) and EU-28 2015/16 exports being lowered 0.5 MMT to 32 MMT "on account of lagging export licenses and greater domestic usage." 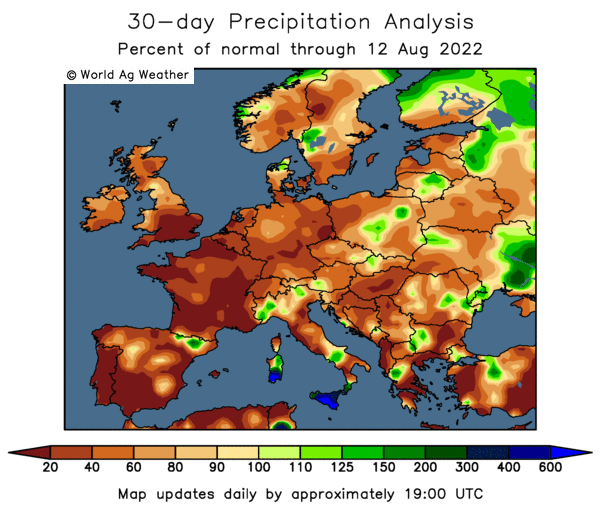 That's the first nod that we'd had from the USDA this season that they were maybe being over-optimistic with EU wheat exports. The USDA also lowered prospective EU-28 corn exports this season EU imports by 1 MMT to 15 MMT this season "on expectations that a greater use of wheat in feed rations curbs demand for corn. In addition, the pace of issuing import licenses has slowed in recent months." That's all for now folks....! 12/04/15 -- Soycomplex: Beans closed higher. The USDA increased US 2015/16 soybean exports by 15 million bu, thereby reducing ending stocks by a similar amount to 445 million bu. That's around 9 million below the average trade guess. World ending stocks came in at 79 MMT in line with trade ideas. Chinese import demand was increased 1 MMT to a new record 83 MMT. Brazil's crop was unchanged at 100 MMT, Argentina's was raised 0.5 MMT to 59.0 MMT. 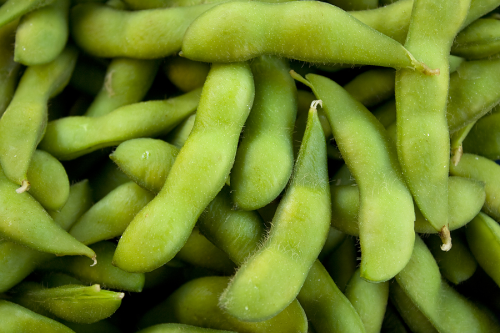 May 16 Soybeans settled at $9.36 1/4, up 8 cents; Jul 16 Soybeans settled at $9.44 3/4, up 8 cents; May 16 Soybean Meal settled at $285.10, up $5.00; May 16 Soybean Oil settled at 33.69, down 21 points. Corn: The corn market closed around 5-6 cents higher following the USDA report. US corn ending stocks were pegged at 1,862 billion bushels versus trade ideas of 1,845 million. World stocks came in at at 209.81 MMT versus the average trade guess of 207.35 MMT. Brazil's corn crop was unchanged at 84 MMT and Argentina's was 1 MMT higher than previously expected at 28 MMT. Brazil's exports were unchanged (as were those from the US) and Argentina's increased 1 MMT to 20.5 MMT. EU imports were dropped 1 MMT to 15 MMT this season "on expectations that a greater use of wheat in feed rations curbs demand for corn. In addition, the pace of issuing import licenses has slowed in recent months." May 16 Corn settled at $3.62 3/4, up 6 cents; Jul 16 Corn settled at $3.65 1/2, up 5 3/4 cents. Wheat: The wheat market closed around 3-5 cents higher. The USDA put US all wheat ending stocks at 976 million bu, very close to what was expected. Chinese wheat consumption took a 2 MT hit, whilst Europe's was boosted by more than 3 MMT. It might be "old crop" but the USDA keep finding a little bit more of it, with Europe's 2015/16 production raised by 1.5 MMT to a nice round 160 MMT. With EU-28 exports lowered 0.5 MMT to 32 MMT "on account of lagging export licenses and greater domestic usage." The net result of which is actually to decrease EU carryout this year from the 20.16 MMT predicted a month ago to 19.33 MMT this time round, although that's still a 40% increase compared to last season. Jul 16 CBOT Wheat settled at $4.58 3/4, up 4 1/2 cents; Jul 16 KCBT Wheat settled at $4.57 1/2, up 3 1/4 cents; Jul 16 MGEX Wheat settled at $5.23 1/2, up 5 1/2 cents. 12/04/16 -- EU grains closed mostly a little higher, with news of Egypt's GASAC snubbing French wheat in their latest tender seemingly coming too late in the day to make too much difference to the Parisian market. 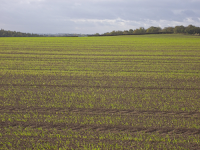 At the finish, front month May 16 London wheat was down GBP0.20/tonne at GBP104.35/tonne, May 16 Paris wheat was EUR1.25/tonne higher at EUR153.00/tonne, Jun 16 corn was up EUR0.25/tonne to EUR153.25/tonne and May 16 rapeseed rose EUR0.75/tonne at EUR367.00/tonne. GASC announced that they'd bought 120,000 MT of Romanian wheat (at least that's EU-origin I suppose) along with 55,000 MT of Ukraine wheat> French offers were said to have been around $3/tonne out. The news may also be taken into context when view alongside that of Tunisia buying at least 400,000 MT of what was probably mostly French wheat in the past few days, along with a 360,000 Moroccan purchase. Algeria, another popular French wheat destination, announced today that they are back in the market for wheat too. It is also notable to see Russian wheat not feature in either of these last couple of Egyptian tenders. Whilst they remain busy exporting wheat, are they more interested in fulfilling existing orders than looking for new business - there is still an export duty on wheat out of there after all. Indeed, the HGCA wonder "could the tax be one of the many factors causing farmers to shift from planting wheat to maize in Russia?" Russian corn production and exports are around double what they were 5 years ago, and both are expected to set new record highs again in 2016/17. In other news, the French Agriculture Minister pegged wheat plantings there this year (excl durum) at 5.24 million ha (+1.2%), with rapeseed plantings +1% to 1.50 million ha. The USDA's WASDE and quarterly stocks reports came out late and will be discussed in the Chicago closing report. 11/04/16 -- Soycomplex: Beans closed firmer across the board heading into tomorrow's April WASDE report from the USDA. Funds were seen as featured buyers today and appear to be comfortable ahead of tomorrow. The average trade guess for 2015/16 US ending stocks is 454 million bushels tomorrow, with world ending stocks expected at 78.96 MMT. Argentine and Brazilian output are seen at 59.0 MMT and 100.20 MMT respectively. Weekly export inspections today were 386,768 MMT, taking the season to date total to 42 MMT, down 7.3% on last year. That's enough to hit the USDA target for the season. The current US Soybean:Corn price ratio is lining up at 2.55:1 on new crop, which is historically high. The top of the market in that was 2.58:1 set in the summer of 2014. May 16 Soybeans settled at $9.28 1/4, up 11 1/2 cents; Jul 16 Soybeans settled at $9.36 3/4, up 11 3/4 cents; May 16 Soybean Meal settled at $280.10, up $6.40; May 16 Soybean Oil settled at 33.90, down 4 points. Corn: The market closed lower. Weekly export inspections of 1.122 MMT were in line with expectations. YTD inspections are now 20.772 MMT as of last Thursday which is 14% down on a year ago. The USDA expects full season corn exports from the US to be down 10.2% in 20154/16. In tomorrow's USDA report the trade sees US ending stocks of 1,845 million bushels, with world stocks at 207.35 MMT. Plant beans instead of corn is what the current new crop price ratio is telling the market. The USDA FAS in Brazil said that the country might produce a record 86 MMT of corn in 2016/17 (the harvest after the current one). 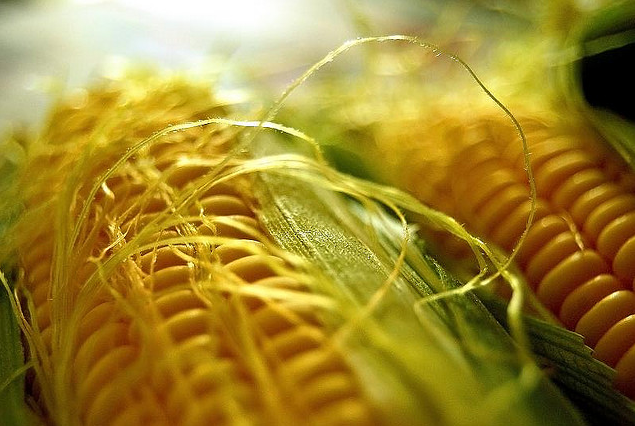 The cash-strapped Brazilian government is considering introducing export duties on corn and beans of 2.8% to increase budget revenues, according to some media reports. Ukraine seaports were said to have shipped out 386,300 MT of corn last week. May 16 Corn settled at $3.56 3/4, down 5 1/2 cents; Jul 16 Corn settled at $3.59 3/4, down 5 1/4 cents. Wheat: The wheat market finished with double digit losses across the three exchanges. Weekly export inspections of 339,226 MT were a bit better than last week, but 28% smaller than the same week a year ago. YTD inspections are 17.155 MMT, still 12.6% smaller than the same period in 2014/15. The USDA expects these to only be 5.5% lower in a season with 4 weeks left to run. Various reports suggest that Brazil will produce a larger and better quality wheat crop than last year if the weather co-operates. The USDA's FAS have plantings at 2.2 million ha, and yields up 7%, for a crop of 6.0 MMT. The USDA has got a nice little boost in wheat exports by demand from Brazil in the past few year. Argentina would usually be the main beneficiary of ant Brazilian demand due to being a fellow member of the Mercosur trade bloc, although they have had volume and quality issues of their own in the last few years they should be OK for 2015/16. Thailand were said to have bought 100,000 MT of US milling wheat. Egypt are back in the market tomorrow. Jul 16 CBOT Wheat settled at $4.54 1/4, down 12 1/2 cents; Jul 16 KCBT Wheat settled at $4.54 1/4, down 16 1/2 cents; Jul 16 MGEX Wheat settled at $5.18, down 11 1/2 cents. 11/04/16 -- EU grains lower, with heavy rains across the US Southern Plains forecast to break any lingering drought talk for winter wheat there. At the finish, front month May 16 London wheat was down GBP1.60/tonne at GBP104.55/tonne, May 16 Paris wheat was down EUR2.50/tonne to EUR151.75/tonne, Jun 16 Paris corn was EUR2.00/tonne lower at EUR153.00/tonne and May 16 Paris rapeseed slipped EUR2.50/tonne to EUR366.25/tonne. "Prolonged drought in the Great Plains may finally be coming to an end. Heavy soaking rainfall from 1.5 to 4 inches is projected in Kansas, Oklahoma and Texas in the 7 day outlook. Conditions have been dry for several weeks in the central Great Plains, so a soaking rain would be very welcome indeed," said Martell Crop Projections. The first week of April proved to be a good one for Ukraine grain exports via seaports. These were up 65% to 693.6 TMT, and included a decent showing from wheat (300.6 TMT), as well of corn of course (386.3 TMT). The top buyer for Ukraine's grain exports last week was Egypt (106.2 TMT) followed by China (85.1 TMT). Russia's exports via seaports were down to 536.2 TMT from 554.8 TMT The previous week. These included 302.4 TMT of wheat, 190 TMT of corn and 32 TMT of barley. Russia's seaport exports Jan/Mar are said to be up 40% year on year, and exports for the season to date are 28.745 MMT (+8.1%), including 21.03 MMT of wheat. Russian spring grain plantings are said to be complete on 5.2% of the planned area. Egypt tendered for wheat gain late in the day. South Korea also in the market tendering for 69 000 MT of feed wheat. FranceAgrimer are due to release their April stocks numbers tomorrow. 08/04/16 -- Soycomplex: Beans closed higher on the day but little altered for the week. CONAB lowered its estimate for the Brazilian soybean crop to 98.98 MMT from their previous estimate of 101.2 MMT. AgResource’s Dan Basse was quoted as saying that Dec beans could hit $7.60 by the end of the year. May 16 Soybeans settled at $9.16 3/4, up 12 1/4 cents; Jul 16 Soybeans settled at $9.25, up 12 1/4 cents; May 16 Soybean Meal settled at $273.70, up $6.90; May 16 Soybean Oil settled at 33.94, down 16 points. For the week that outs May 16 beans 1 1/2 cents lower, with meal $1.40 higher and oil 51 points lower. 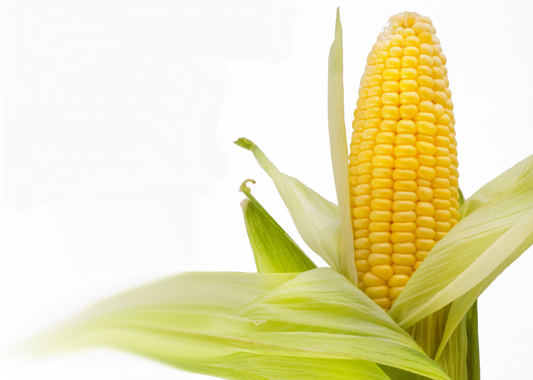 Corn: The corn market closed a touch firmer on the day. The USDA announced the sale of 120,000 MT of corn to unknown destinations for 2015-16 delivery under the daily reporting system. The Argentine corn harvest is estimates 18% done. AgResource’s Dan Basse talking at an EU cereals meeting said that corn could fall below $3/bu in Q4 of this year. French new crop corn planting was 1% done as of Monday night. Early plantings in Russia and Ukraine are also underway. UkrAgroConsult report that Sep/Feb Russian corn exports were up 75% from the same period last year. Output here could be at all-time highs again in 2016/17, so why not exports? May 16 Corn settled at $3.62 1/4, up 3/4 cent; Jul 16 Corn settled at $3.65, up 1 cent. For the week the two saw net declines of 8 /1/4 and 7 1/4 cents respectively. Wheat: The wheat market closed higher on the day, but only consolidating overall weekly losses. Kansas wheat fared the worst of the three exchanges on the week as the USDA renewed it's weekly crop condition reports Monday night, and this came in better for wheat on the Plains than the market had been expecting. AgResource’s Dan Basse mooted ideas of Chicago wheat down to $4/bu come July. US wheat continues to struggle to find export homes. French wheat won the one Egypt order this week but their exports still lag too. 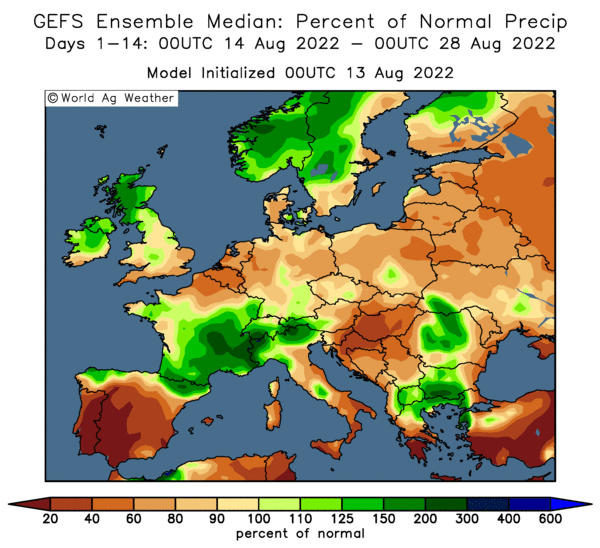 Meanwhile French wheat crop conditions are the best for 5 years heading towards what could be another record harvest. Jul 16 CBOT Wheat settled at $4.66 3/4, up 2 1/4 cents; Jul 16 KCBT Wheat settled at $4.70 3/4, up 5 1/4 cents; Jul 16 MGEX Wheat settled at $5.29 1/2, up 7 1/4 cents. For the week, Chicago wheat fell 16 1/4 cents, with Kansas down 17 3/4 cents and Minneapolis shedding 8 1/2 cents. 08/04/16 -- EU grains closed mixed on the day and little altered for the week. At the finish May 16 London wheat was GBP0.15/tonne lower at GBP106.15/tonne. May 16 Paris wheat gained EUR1.00/tonne to EUR154.25/tonne, corn fell EUR0.25/tonne to EUR155.00/tonne and rapeseed closed a euro higher at EUR368.25/tonne. For the week there was little significant change, with London wheat up GBP0.15/tonne, Paris wheat down GBP4.75/tonne, corn EUR2.25/tonne easier and rapeseed unchanged. Brussels reported soft wheat export licence requests of only 467.2 MMT this week - than than the volume granted for corn imports (448.4 TMT). The wheat export licence number was a disappointment being a 14-week low. Cumulative soft wheat licences for the season are around 12% down on a year ago at 22.6 MMT. Barley export licences were granted for 92,000 MT - similar to a week ago. YTD barley export licences are up 17% at 8.1 MMT. After only buying just the one cargo in yesterday's GASC tender the Egyptian Interior Ministry warned that corruption in the wheat sector was rampant and must be tackled, Reuters said. They will now be harvesting their 2016/17 wheat crop, and the government pay among the highest prices in the world for home-produced wheat in an effort to stimulate production. 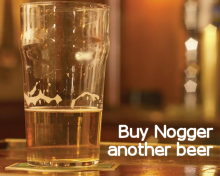 The temptation is large to pass off much cheaper imported wheat as domestically produced therefore. Morocco bought 360,000 MT of EU origin wheat and 12,000 MT of durum for Apr/May shipment. Customs data shows France exporting 1.8 MMT of wheat in Feb, of which 1.1 MMT went to non-EU destinations. The largest such taker was Morocco (362,000 MT) followed by Algeria (305,000 MT). Jul/Feb French wheat exports are thus 11.4 MMT (-5%), with 6.8 MMT (+2%) of that going outside the Union. FranceAgriMer reported French winter wheat crop conditions unchanged on a week ago at 92% good/very good. Winter barley conditions were also unchanged in the top two categories at 91% good to very good. The proportion of French wheat displaying an ear of at least 1cm is now 94% versus 80% a week ago and 85% this time last year. Barley at that stage is 96% versus 85% a week ago and 93% last year.